IF THERE was a defining economic problem for America as it recovered from the financial crisis, it was stagnant wages. In the five years following the end of the recession in June 2009, wages and salaries rose by only 8.7%, while prices increased 9.5%. In 2014 the median worker’s inflation-adjusted earnings, by one measure, were no higher than they were in 2000. It is commonly said that wage stagnation contributed to an economic anxiety in middle America that carried Donald Trump into the White House. Yet Mr Trump’s rise seems to have coincided with a turnaround in fortunes for the middle-class. In 2015 median household income, adjusted for inflation, rose 5.2%; in 2016 it was up another 3.2%. During those two years, poorer households gained more, on average, than richer ones. The latest development—one that will be of particular interest to Mr Trump—is that blue-collar wages have begun to rocket. 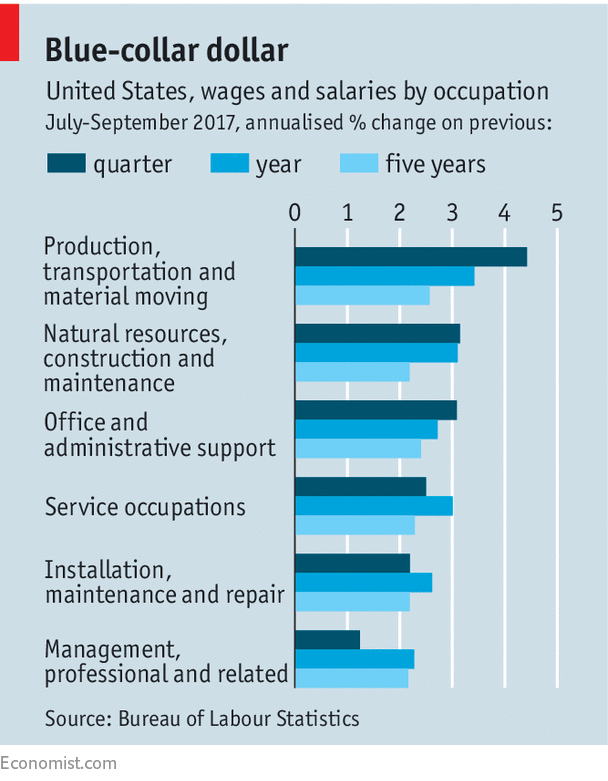 In the year to the third quarter, wage and salary growth for the likes of factory workers, builders and drivers easily outstripped that for professionals and managers. In some cases, blue-collar pay growth now tops 4% (see chart). Has Mr Trump delivered on his promise to revive American manufacturing, mining and the like? A more probable explanation is that he came to office just as America began to run out of willing workers to fill all of its job vacancies. As unemployment has fallen from over 6% in mid-2014 to just 4.1% today, wage growth has gradually picked up. At first it seemed like the biggest beneficiaries of a tight labour market would be those in service occupations, such as waiting and cleaning. A year ago service workers were enjoying the biggest pay rises in the economy—3.4%, on average. (Higher minimum wages also helped; 25 states and localities raised minimum pay in 2016.) Over the last year, however, growth in service wages has decelerated slightly. At the same time, blue-collar wage growth has surged ahead. In some industries the labour shortage seems acute. Now is not a good time for Americans to remodel their bathrooms: tile and terrazzo contractors earn 11% more per hour than a year ago (and fully one-third more than in 2014). Having a bath might get pricier, too: workers who make soap have also enjoyed 11% wage gains over the past year. Strong demand, rather than a productivity boom, is driving the scramble for workers. In the manufacturing sector, for example, output per hour worked is just 0.1% higher than a year ago, and has not grown at all in the past five years. Production and wages have picked up anyway. One reason is a cheapening dollar. On a trade-weighted basis, the greenback fell by almost 9% between the start of the year and mid-September (it has since recovered a little). A weaker dollar and a strengthening world economy have spurred demand for American goods. In the first three quarters of the year, goods exports were up nearly 4% on 2016. At the same time, a rebound in oil prices from their trough in early 2016 has set off another cycle of investment in the shale industry. There are currently 907 active oil rigs in America, up from 568 a year ago, according to Baker Hughes, an oil services firm. Economists at UBS, a bank, estimate that energy investment has driven nearly three-fifths of all economic growth in 2017, once the effect of fluctuating inventories has been stripped out of the figures. If these trends continue, higher wages might begin to tempt more men, who dominate blue-collar occupations, to look for jobs (those who do not seek work do not count as unemployed). For the past two years, the strengthening labour market has encouraged more jobseeking by so-called prime-aged workers, ie, those aged between 25 and 54. But the increase in workforce participation has been almost entirely concentrated among women (see chart). At 89%, male prime-age participation remains close to a record low. 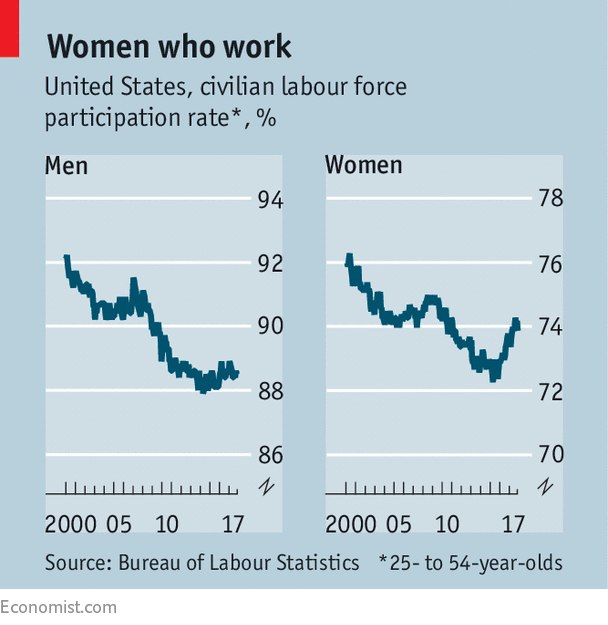 Whether male participation improves may depend on whether men are prepared to up sticks and move to where the labour market is booming. UBS’s economists note that Texas and neighbouring oil states such as Oklahoma account for almost all of the acceleration in manufacturing employment this year. 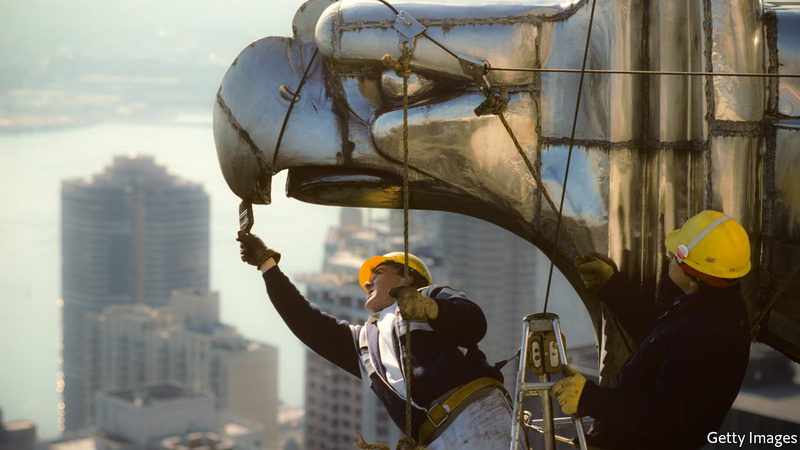 Industries and places where blue-collar employment has been in a decades-long decline are unlikely to stage a recovery. Jed Kolko, chief economist for indeed, a jobs website, says that even some of the recent wage gains are misleading, because they have occurred in industries, such as textile manufacturing, in which employment continues to fall. Rising incomes for lower- and middle-earners may help reduce inequality, especially if wage growth for higher-earners remains subdued. A recent analysis by the Economic Policy Institute, a left-leaning think-tank, found that real wages for the top 1% of earners fell by 3.1% in 2016, and were lower that year than they were in 2007. As workers’ wages grow, firms’ profit margins may also come under pressure, reducing, somewhat, the capital income of the rich. Texas Roadhouse, a chain of steak restaurants, recently warned investors that it expects its wage bill to grow by 7-8% in 2017. After years of imbalance, a shift in economic power towards workers is to be welcomed, so long as inflation remains low. Yet wage growth also helps to determine the fate of politicians, whether or not they deserve it. Mr Trump’s election led to soaring small-business confidence, which is yet to abate. His promise to deregulate the energy sector may have spurred some investment. Yet his apparent economic success to date mostly reflects fortunate timing. That will not stop him from taking the credit should a tight labour market lift America’s spirits as the 2020 presidential election approaches. Rightly or wrongly, the biggest beneficiary of a sustained wage boom for workers may be a suited man sitting in the Oval Office. Arriving in Brussels this year as the Financial Times’ new EU correspondent, there was one tip I was given several times: the Germans are the key to everything in this town. That was early September, just ahead of Germany’s general election, and Brussels was awakening from its summer slumber. The advice made sense. As an outsider looking in on EU affairs, it seemed like nothing got done in Europe — on banking union, Brexit or anything else — without German consent. Today, Germany is in the middle of drawn-out coalition talks. Angela Merkel, its chancellor, has another term in the bag but the composition of her new government — likely to include the pro-EU Greens and the more eurozone-sceptic Free Democratic party — is yet to be finalised. In Brussels, the phrase “after the German elections” has been replaced by “after the German coalition talks”. But this is hardly a town on hold. Europe’s biggest political shift this year occurred in Paris not Berlin. Emmanuel Macron, France’s pro-European centrist president, has breathed fresh life into the EU capital, where he is arguably more popular than anywhere else in the world (including his homeland). Mr Macron’s determination to create an EU that “protects” its citizens while forging ahead in areas such as tax policy, defence and monetary union has received a warm welcome in the European Commission, the EU’s executive body. His presidency is likely to announce a new era in Germany’s already complicated leadership role in Europe. In the early years after reunification, the German approach to Europe was summed up by the term “benevolence”. Integration in the single market, defence and enlargement were in the newly unified country’s self-interest, while German support for joint European endeavours was vital in ensuring that the EU moved forward. As the academic Beverly Crawford wrote in 2007, Germany “has been Europe’s ‘patron’, in that it has taken on a disproportionate share of the regional burden of institutionalised cooperation”. All that changed dramatically with the eurozone crisis. Europe’s biggest economy, and thus largest creditor nation, was thrust into a position where it had to call the shots. With German taxpayers on the hook for bailouts from Ireland to Greece, Berlin could no longer “lead from the back”. The crisis blew apart the notion that Germany could continue to be an economic giant but a political dwarf. Yet the sovereign debt crisis created its own dynamic, particularly between Ms Merkel and her then French counterpart Nicolas Sarkozy. With the bombastic Mr Sarkozy at her side, the chancellor could at least indulge the pretence that France was running the show, safe in the knowledge that her chancellery was pulling the strings. Now the French really could be running the show. Germany is being urged to follow Mr Macron’s lead. Joschka Fischer, Germany’s pro-federalist former foreign minister, has called on Berlin to drop its erstwhile caution and embrace the French president. And Jürgen Habermas, Germany’s most prominent public intellectual, has warned of the danger of “gambl[ing] away a historically unrivalled opportunity”. Can Germany manage this shift from reluctant hegemon to subordinate? There are signs that the German establishment is already fighting back. Jens Weidmann, chairman of the Bundesbank, is being spoken of as a contender to become the next president of the European Central Bank. Should he gain the backing of Ms Merkel, it would mark a major change for a country that has traditionally been uncomfortable with occupying the biggest posts in Europe. For Brussels, the problem is not Germany’s domestic political flux, but the fact that Ms Merkel is at risk of looking horribly old-fashioned in the age of Macron. Will Proposed U.S. Tax Cuts Pay for Themselves? Knowledge@Wharton: Kimberly, you earlier looked at the static budget model that had been released recently, and now the House has released its version. We will also have the full Senate version shortly. Would you please give us an overview of what the big tax changes are in the House bill, which could be voted on very son? Kimberly Burham: One of the big things is that rather than keeping seven income tax brackets for individuals, they are narrowing that down to four. The other big thing is that they are doubling, roughly, the standard deduction while repealing personal exemptions. And they are also expanding the child tax credit and repealing a lot of itemized deductions. On the business side, they are also repealing a lot of tax expenditures, deductions and credits, but they are really lowering the rates. There, they are going down to a 20% tax rate on corporations, and then for pass-throughs a top rate of 25%. So there are a lot of tax cuts, and they are trying to pay for them by broadening the base. Knowledge@Wharton: What happens to debt under your model? Burham: Our dynamic analysis shows that over 10 years, it increases federal debt somewhere between $2 trillion and $2.1 trillion. By 2040, debt will increase from somewhere between $6.3 trillion and $6.8 trillion more than it would under current policy. Overall, both tax bills are a tax cut — taking revenue out of the system. Knowledge@Wharton: You have just described debt. What would happen to economic growth? Burham: The tricky thing about debt is that as you increase debt in the long run, it actually dampens economic growth, and that’s because some of the savings that people have don’t go into private investment – they go into paying for the debt. As a result, after 10 years, the tax cut and jobs act will increase GDP somewhere between 0.33% and 0.83% relative to where it would have been in 2027. However, this boost fades over time, mostly due to the rising debt. And by 2040, GDP could even fall below, in some scenarios, the current policy GDP. Knowledge@Wharton: What does analysis by other groups show? Burham: There are a lot of other groups that produce similar analysis. There is the Congressional Budget Office, which is the official score-keeper. There are a few other groups out there and they are sometimes similar, sometimes different from us. In addition, it matters for these dynamic models what parameters and assumptions that you are making. In particular, there are two key parameters. One is the assumptions that you make about the return to capital. And you could think that as the return to capital, you could set it at something like the return to the S&P — a relatively high rate of return. Alternatively, you could set it a bit lower — at the risk-free rate of return. We think that probably the lower setting is a little more realistic in the long run. However, everyone can decide what they think [by plugging in numbers they prefer into the online simulator]. When you take one of these models and assume a high rate of return — that really increases investment, which fuels growth. And therefore, you find more growth and less debt, because the tax cuts appear to pay more for themselves. The other [key assumption] is the openness of the economy, the international capital flows, which are related to trade as well. So in that model, debt doesn’t matter because every time the government issues it, a bunch of foreign dollars flow in. You have to think about that in terms of [the question] does some other country own the United States? Do they own more and more and more of the assets of the country? And there are effects on trade. Knowledge@Wharton: Do the tax cuts that are proposed in the House plan pay for themselves? Who gains from the tax changes — which income group? Burham: In fact, they don’t fully pay for themselves. We do see over the 10-year period that we can make up for about $500 billion with the dynamic model. But overall, they’re still adding to the debt and increasing deficits over that period. [Regarding winners and losers,] there are two ways to look at it. One way is that you could think about who is getting most of these benefits. And in that case, most of the tax cuts are accruing to upper-income households. But the other question is: What’s happening to progressivity [of the tax code] over the whole system? That is, [which income groups] pay what share of the entire federal tax bill? We find that it is surprisingly stable. For instance, in 2018, with no tax bill, people in the top 10% of the income distribution will pay 28% of total taxes. Meanwhile, under the Tax Cut and Jobs Act, they would pay 27%. So those numbers are pretty close. In addition, even if you go far out all the way to 2040, the difference they would pay is 30% if we did not change the tax system, and the top 1% would pay 28% if we did change the tax system. It is surprising that there is not a larger effect on progressivity, but it’s pretty stable. Knowledge@Wharton: Does that mean that things aren’t changing down the line that much, either, if things aren’t changing at the top that much, when it comes to progressivity? Burham: Yes, that does mean that basically the tax bill is not being shifted lower down the income distribution. It is being maintained. Knowledge@Wharton: This House bill could be voted on very soon. At the same time, the Senate is going to be releasing their full bill soon. They’ve released some highlights, but not all the detail that you would need to run a good model. But can you tell us something about the difference between the House version and the Senate version? Burham: Sure. So the House version, for individuals, goes from seven brackets down to four. The Senate bill keeps the seven-bracket system. They do change some of their rates. For instance, the top rate will go from 39.6% to 38.5%. Like the House, the Senate bill also roughly doubles the standard deduction and repeals personal exemptions. Moreover, the Senate bill expands the child tax credit even further, so that more of it will be refundable than under the House bill. On the business side, they also go down to a 20% rate on corporations. However, they do not start that until 2019, so they delay that by a year. And the other thing they do on the business side is approach pass-through companies a little bit differently, so the House side has a 25% pass-through rate, and the Senate instead allows them a 17.4% deduction to lower the taxes for pass-through businesses. In many ways, however, U.S. strategy in the region hasn’t changed. Consistent with Barack Obama’s “pivot to Asia,” it still focuses heavily on freedom of navigation and overflight, cementing a rules-based economic order, and the need to help regional states deter coercion from expansionist powers (read: China). Some aspects of the U.S. approach certainly have shifted. As could have been expected, Trump explicitly denounced multilateral trade pacts – a major component of past U.S. strategy – and hinted at a somewhat more hands-off approach to managing flashpoints like the South China Sea. But the underlying message in Trump’s broad strategy for the region was that the U.S. is not withdrawing from Southeast Asia, despite regionwide uncertainties about future U.S. engagement; it’s just not going to entangle itself in commitments that stray from core U.S. interests. The underlying drivers of the U.S. strategy were reflected in an offer Trump reportedly made to mediate disputes between China and Southeast Asian states over the South China Sea. The U.S. cannot be the peacemaker in the South China Sea dispute, primarily because China’s moves in the waters are largely motivated by the U.S. position in the Western Pacific. So long as the U.S. maintains a significant military presence along what’s known as the First Island Chain – Japan, Taiwan, the Philippines and Indonesia – it is a threat to block sea lanes that are critical to China’s export-dependent economy. China’s only viable strategy to ensure its access to the Pacific is to reach a political accommodation with a country in this chain that China can be certain wouldn’t side with an outside naval power during a major conflict. Its assertiveness in the South China Sea is thus a means toward that end, but also a contingency, in case that strategy fails. In other words, Beijing is betting that its overwhelming superiority compared to weaker Southeast Asian states will diminish the appetite for confrontation among its southern neighbors and turn their attention toward the tangible benefits of cooperation, particularly on the economic front. But even if such an arrangement proves elusive, this strategy still enables China to build up its maritime defenses in an effort to raise the costs of an attack on the Chinese mainland. Although this strategy risks driving these states toward the U.S. and its allies, China has little choice but to pursue it. Trump’s offer to mediate should not be taken at face value and should instead be seen as an expression of two things. The first is that the U.S. capability and willingness to secure core strategic interests in the Western Pacific is permanent – and China can’t challenge that – effectively making it the arbiter of maritime issues that it decides merit its involvement. The second is that China’s goals in the South China Sea shouldn’t be automatically at odds with those of the United States, meaning China should fear containment only if it gives the U.S. and its allies little choice but to contain it. The main U.S. interest in the South China Sea dispute is preventing a conflict or an erosion of maritime law that threatens to disrupt seaborne trade. Some 30 percent of global maritime trade and about half of global oil tanker shipments pass through the waters each year. The U.S. is signaling to Beijing that it’s willing to help shape a settlement between China and other claimants in the region that both eases Chinese anxieties and complies with international law and maritime norms. But for China, this would amount to ceding its claims in the disputed waters, undermining its overriding strategy. The U.S., therefore, is also indicating that continued Chinese expansion will come at a cost. For example, this weekend saw the first meeting in 10 years of the so-called Quadrilateral Security Dialogue – a loose coalition involving Japan, India, Australia and the U.S. intended to prepare for the possibility of future Chinese aggression. The U.S. is also leaning on its allies – Japan, in particular – to offer security assistance to Southeast Asian states. The drawback for the U.S. is that if it appears to be washing its hands of the territorial disputes in the South China Sea altogether, it will heighten the sense among claimant states like the Philippines and Vietnam that the U.S. is unreliable. This plays into the Chinese narrative that Southeast Asian states would be wise to accept as a fait accompli its ascension as regional hegemon. Notably, the leaders of both Vietnam and the Philippines appeared to dismiss Trump’s offer out of hand. Philippine President Rodrigo Duterte rejected potential U.S. military involvement on the issue, while Vietnam moved forward with bilateral negotiations with Beijing. Both countries will cautiously boost military cooperation with the U.S. and rest on assurances that a major crisis would threaten the U.S. interests and thus compel an intervention. But the fact that they don’t want to antagonize Beijing by involving the Americans in negotiations with China underscores the limits of U.S. influence and leverage over how the disputes play out. The current U.S. position on trade is also difficult to square with broader U.S. goals in the region. The strategic impetus for the original Trans-Pacific Partnership, which fell victim to domestic politics in the U.S., was to deter Chinese economic coercion in Asia, solidify U.S. partnerships in a trade-focused region, and cement an open, rules-based and U.S.-centric economic system. Trump wants to replace it with a series of bilateral trade deals. In addition to security cooperation, the Quad is expected to focus heavily on coordinating infrastructure investments to balance China’s One Belt, One Road investments. To an extent, Japan is filling the void on the economic front as well by balancing the surge in Chinese investment in Asia and spearheading efforts among the 11 remaining TPP members to revive the trade pact. Indeed, TPP-11 countries struck a broad agreement in principle on reviving the deal this weekend, leaving the door open for Washington to return if the political environment in the U.S. reverts to the broadly pro-trade orientation it has maintained since World War II. But all these alternatives are works in progress, at best. Trump spent much of the past week pressuring regional states, including close allies, to narrow their trade imbalances with the United States. At this point, there’s not much political or economic logic driving a multipronged trade push. Overall, however, Trump’s trip to Southeast Asia has underscored the reality that the new “Indo-Pacific” strategy isn’t really that much of a departure from what the U.S. was already doing in the region. The U.S. has always been loath to risk getting dragged into a war not of its choosing by entangling itself in the South China Sea dispute. As a result, it has limited itself largely to symbolic moves like so-called freedom of navigation operations (where a U.S. warship discredits Beijing’s territorial claims by sailing near Chinese-occupied islands), while quietly bolstering its military footholds along the First Island Chain and around the Malacca Strait. Shifting security burdens to allies has been the U.S. strategy for a decade now. What’s different is that the U.S. is more openly narrowing its focus to the core interests that were the main drivers of its regional strategy in the first place.